I was young, I was naive. I had unbounded self-confidence (or arrogance? ), thinking that I knew just what my country needed and how! 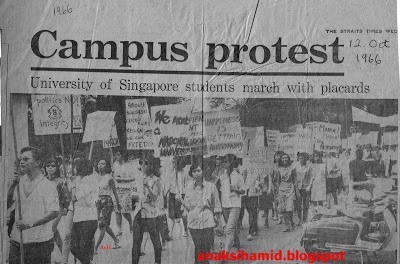 With gusto and hauteur, my fellow undergraduates and I in 1966 marched in protest at the Singapore University Campus against the Suitability Certificate (a condition for admittance into University) and the right for Academic Freedom and Autonomy. 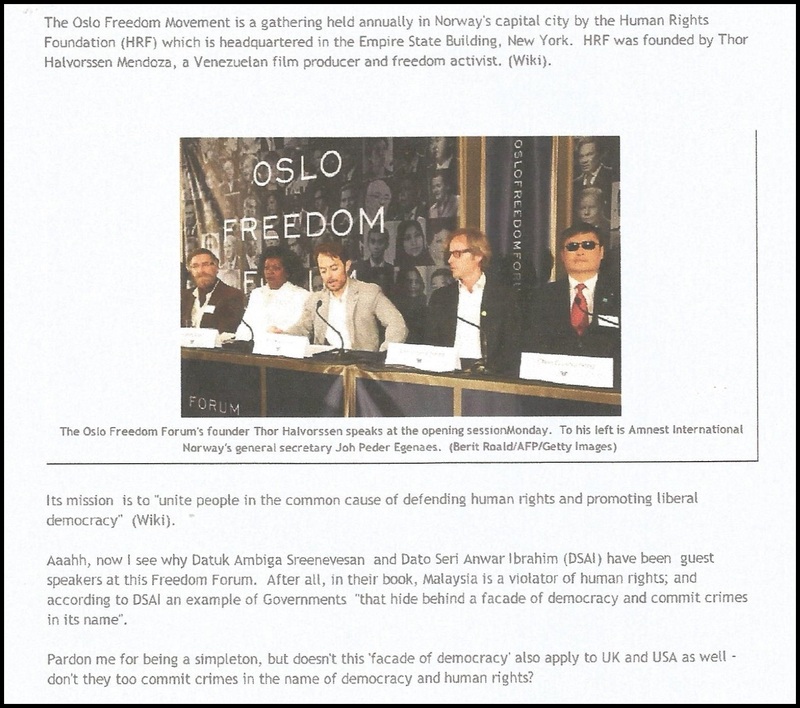 AsH the Samseng 'freedom fighter' - 4th from left. (Note the scooters on the right.) One of the placards carried this indignant message : Politics NO! Integrity YES. Some of the leaders and participants on that march - when they graduated and moved into the real world - took no part in either politics or integrity!! Out of that single Campus protest I recall one of the most radical and vociferous voices against the system, who became a member of a political club - no, not the Democratic Socialist Club (a sort of wishy-washy pal of the PAP) but the more radical Socialist Club. After we all graduated in 1967, this hard-core 'leftie' (by Singapore standards) got himself a plum job in the Ministry of Culture, Singapore. It's all about the fox in the hen-house! Or the proverbial 'heart on the left and pocket on the right' !! So you see, protests of the young and not-so-young against the system are nothing new. Although it's quite impossible to see this scenario in Singapore nowadays (no wonder several of our politicians and social commentators are dead keen on emulating Singapore) protest movements in Malaysia are almost like an annual festival, in all shades of colour, gaiety and agenda. Another fascinating feature of these Malaysian "Springs" is the network created, extending over national and international landscapes -and even occurring in one of the world's youngest states, Timor Leste. This, of course, is partly because (compared with the dinosaur-technology of the 1960s) communications today are much more advanced, with the internet and the social media making connections more pervasive and widespread. But I often wonder why this 'spring' has not sprung in Malaysia's own backyard in the rural and poorer parts of the nation. Could it be they don't have mobile telephones? Of course they do. So could it be other things are more important?? Then there's the matter of leadership, and who it is that inspires. Well, every cause and protest movement must have a leader - a charismatic and articulate leader who can wield the arm of unity of belief and purpose. 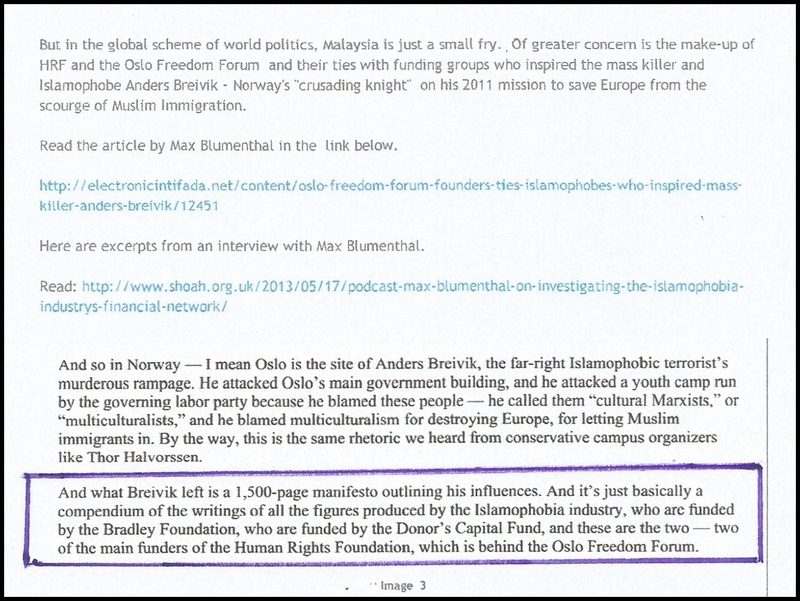 And such a leader there is, according to a reliable source: one who crossed the globe to make a "special guest appearance in London to meet Malaysians ..... kindly agreed to give a talk this Sunday 23rd August in Central London." And who then "flies home to take part in the main KL march but she will be with us in spirit." The leadership's clarion calling sounds almost messianic. 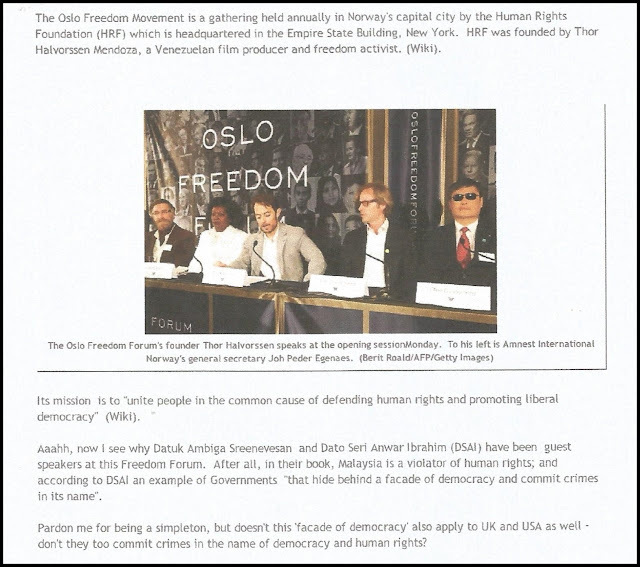 But let's not forget that there can be other external guiding leaders and mentors like the Oslo Freedom Forum, organised by Thor Halvorssen Mendoza's Human Rights Foundation (HRF). George Bernard Shaw had this to say about Age: Youth, which is forgiven everything, forgives itself nothing: age which forgives itself anything, is forgiven nothing. I do envy the young Malaysians who, on the 29th and 30th August (with non-Malaysian support) had the means, the reasons and the opportunities to go into the streets of London, especially at Belgrave Square, to demand the resignation of the Prime Minister of Malaysia. In 1975, at the London University School of Education (Malet Street), I was sitting in a classroom with my other classmates waiting for the lecturer to turn up. Then a couple of students stopped at the door, calling us to join them in a demonstration downstairs. One of them gave me an intense look as if to say "what about you?". I had to respond, " Sorry, I'm here at my own expense. I intend to get the education I paid for." Some of my classmates shook their heads to indicate 'no', the others simply ignored them. You see, I couldn't afford to expend my energy and time supporting "good causes". I was living week to week on my meagre allowance. By the weekend, I would have just enough milk and bread to see me through till Monday when I began my next allowance. For 'entertainment', my good friend Loo Lee and I would pack a meal of sandwiches and milk and go for lovely, long walks in the various beautiful parks in London or venture to the free British Museum and National Gallery. For transport we had our monthly season ticket on the Underground. Furthermore, my father did not have the benefit of a pension or an accumulation of property and financial reserve to subsidize my one year at London University. In fact, my parents were dependent on my siblings' and my financial support. For this post-graduate course I was supporting myself on my savings and my six-months half-pay. I had my budget finely tuned so that it would last right through the Examination and I could then seamlessly get back to teaching when I had the additional piece of paper. I toyed with the idea of spending another year at the School of Education to get to the Masters-of-Education - I reckoned I could get by for the extra year with part-time jobs. (I already had an evening job clearing tables at the ULU Refectory). But three months into my course, on 21 December 1974, my father passed away and I knew I had to go home and stop at the Academic Diploma. The Masters degree had to wait - for another 10 years. 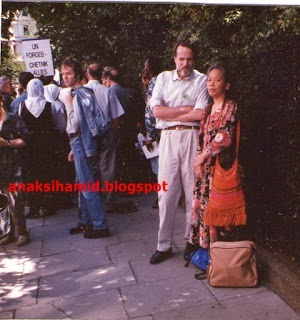 Jai came along with us for this demonstration against the war in Bosnia in 1995. The brown bag contained our drinks and food for lunch and pre-dinner comestibles. Since the mid-1980s, the spouse and I have been to umpteen protest marches in England. It involved travelling nearly 100 miles from Leicester to London and another 100 miles to get back home. Sometimes we took the National Express coach, or we drove and parked the car at Golders Green. At other times we travelled with the local Anti-War or Support for Gaza coaches. At the turn of the 21st century there were two huge demonstrations against the War on Iraq. My sister and brother-in-law, Mak Haji Maznah (60) and Pak Haji Harun (67), - two retired cikgus from Batu Pahat -joined us for the 400,000 anti-war demonstration on September 28, 2002. That was a day they will never forget. 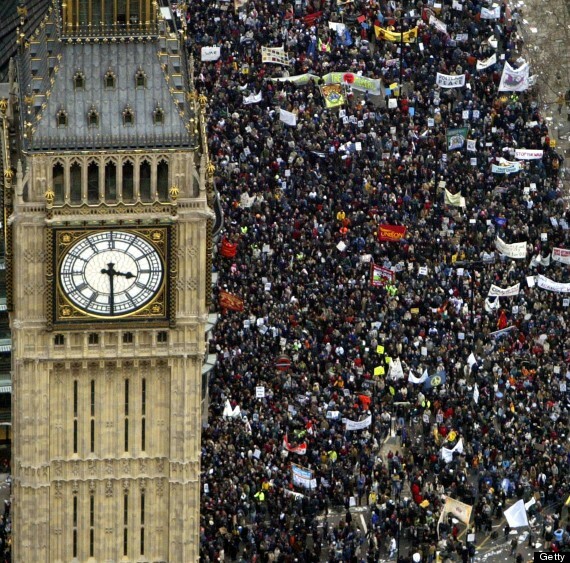 We were on our own for the largest ever protest march - over 1 million - on 15 Feb 2003. We were all expressing our worry and concern over a second attack on Iraq (following the First Iraq War of 1990-1991). This anti-war protest took place all over the world. Of course, thanks to the arms manufacturers, the oil-thirsty industrialists, Israel, the Islamophobes, the power-mad leaders like Blair and Bush (AND with the tacit and not-so-tacit agreement of the Arab states) Iraq was shredded to pieces. 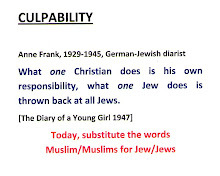 But this was just part of the bloody dismemberment of the Muslim world (from Iraq, Libya, Yemen, and Syria, to Palestine, Somalia and Afghanistan) led by the world's two most powerful Judaeo Christian nations. 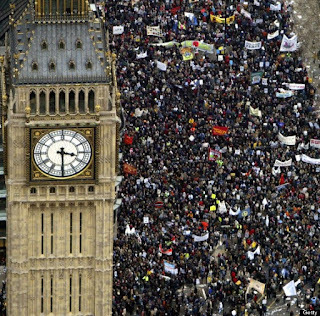 The Anti-War Protest of 15 February 2003. Such is the strength of "people power" that one month later - after and despite this huge demonstration against the War - on 19 March 2003, Bush invaded Iraq. The protest against this war was expressed not only by Muslims (well, some Muslim nations) but across every colour, creed, religion and nationality. Then in November (18-21) 2003, Bush made a formal visit to Great Britain. He was granted a Royal audience. The establishment knew of a looming anti-Bush and anti-war demonstration and decided to keep Bush's route a secret so that the American President would not be embarrassed by those tens of thousands of the British populace lining his route and calling him a war criminal and shouting at him to go home. November 2003 - the spouse holding our very own home-made and home-designed placard. It was inspired by that very popular 1960s song, "Yellow Rose of Texas". By then , of course, the British public were weary, disheartened and disillusioned. The main issue of the war against the Muslim world was less popular - although people did at least maintain a sense of loyalty to their "boys" who were fighting in a war that they did not want or believe in. 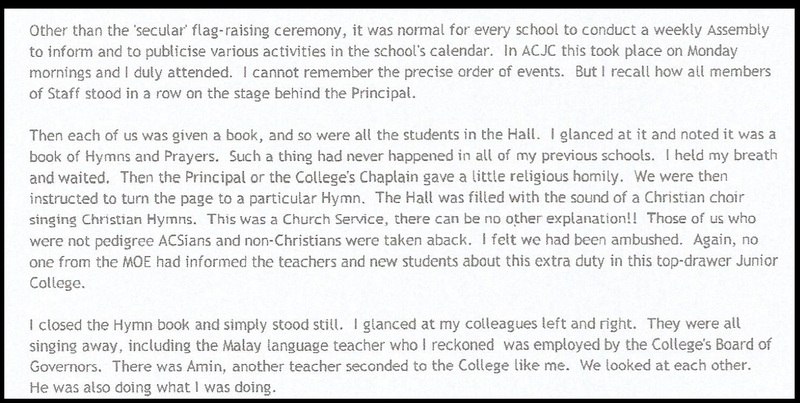 (Which made me wonder: would most Malaysians feel and act the same way in supporting our "boys"? The history of the Communist Insurgency from 1948 to 1960, at least, suggests not. After 2003, in Leicester and London,we attended several other activities in support of Palestine and Gaza. We got no buzz and no kick from such demonstrations. In fact, if anything, we went with a sense of gathering despondency at the way so many hundreds of millions of people were being made to suffer..
And I would always remind myself of a basic truth: as a Singaporean and later a Malaysian, I had been so very fortunate in never having to suffer or fear mayhem and bloodshed because my country had been attacked and occupied by the Big Boys of the world. For one who's a loner and a maverick, I don't expect overt support for my unconventional and bolshie viewpoints. But I do try to remember the victims. Of all kinds. 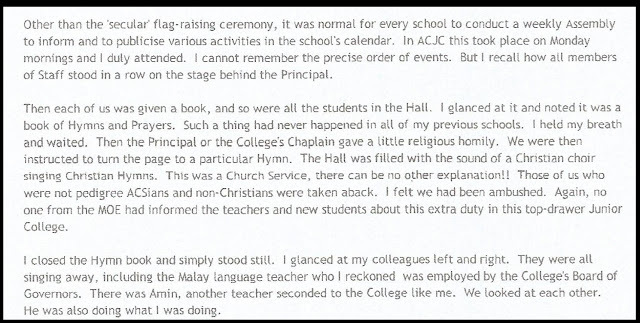 I hold very dear this memory from 1978 when I was sent to teach at Anglo-Chinese Junior College, Singapore's most pukka missionary Sixth Form College. Of course, the world is much wider than this. In the end, I can only hope that our (and so many others) presence at all those street protests will transmit to the voiceless, neglected, unrepresented victims our empathy for their sufferings. 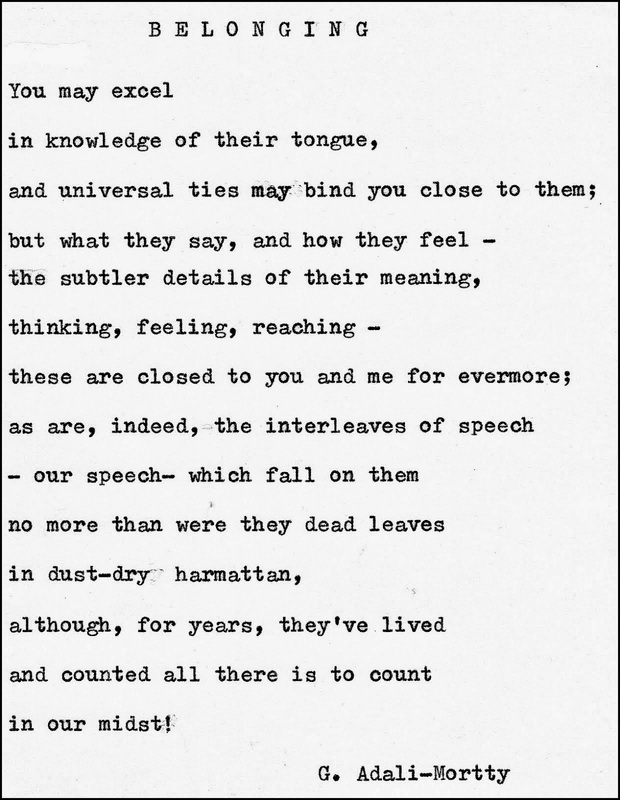 And the knowledge that they are not alone - albeit it's just cold comfort. The news cries out for more empathy. Take the plight of refugees risking their lives to escape war and violence in their now-demolished homelands. The sound of (near) silence is almost deafening. Rock on, Kak AsH and Abang Iain! Thank you. What a lovely surprise to 'see' you. Our 'rocking' days are over but we can still hobble on just to wind up the nerds of this world. Little China and Big China - a Malaysian ordeal?